On November 9 2012, Japan Airlines (JAL) announced that they have signed up to be one of the official partners to support Tokyo's bid for the 2020 Olympics and Paralympics. 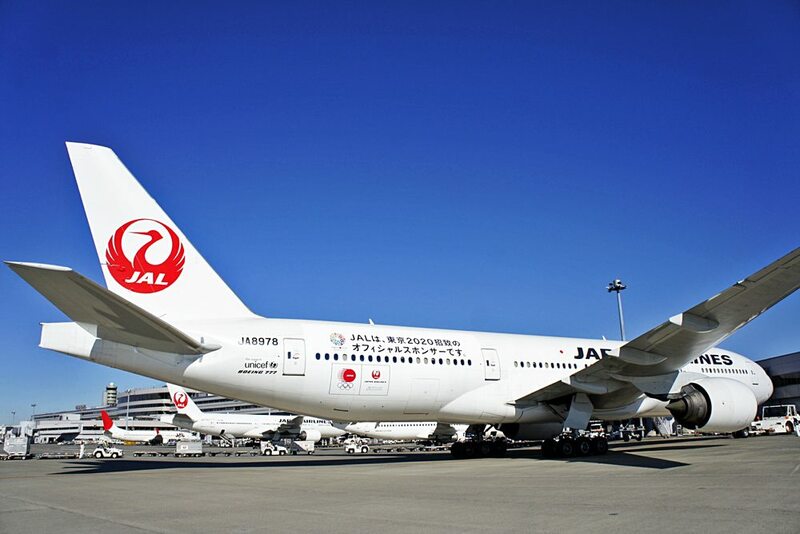 One of the ways JAL shows its support is to fly an airplane with special livery. Today JAL has officially unveiled the Tokyo 2020 special livery at Tokyo Haneda. According to Japanese news site SankeiBiz, JAL will operate about 6 domestic flights a day with this plane and there are plans to have a plane with special livery to fly internationally later too! Not sure would that be a 767-300ER just like they did with the Samantha Thavasa Jet 2012 which mainly flies within Asia, to Honolulu, Canada and chartered flights or they will paint the 777 fleet which flies both long-haul and regional flights :) But either way I am definitely looking forward to the special livery on international flights. The commencement flight for this Tokyo 2020 livery was JL909 from Tokyo Haneda to Okinawa Naha today. To celebrate for this event, JAL staffs, including JAL Chairman Masaru Onishi, and Japan's women gymnastic team gathered at Tokyo Haneda Monorail station to give out goodies to promote the Tokyo 2020 bid. You can see more pictures on JAL official Facebook page (Japanese only).